The casino at Jeju Shinhwa World in South Korea opened to the public on Sunday, four months after some of the first resort facilities were launched to paying customers. The casino had previously been scheduled for a December 8 launch, which was subsequently put back further. Landing International Development Ltd, the Hong Kong-listed mainland real estate group behind the resort – which has a foreigner-only casino – only received local government permission for gaming with effect from February 21, the company said in a press release. The casino rights involve transfer of gaming from another property on Jeju Island that has been operated by Landing International. Jeju Shinhwa World Landing Casino houses 155 live-dealer gaming tables including ones for baccarat, poker, blackjack, roulette and sic bo, and 239 slot machines and electronic table games. The firm had been given permission to operate a casino of approximately 5,500 square metres (59,200 sq feet), which it said was “about seven times of that of approximately 800 square metres” in its old property at Hyatt Regency on Jeju. 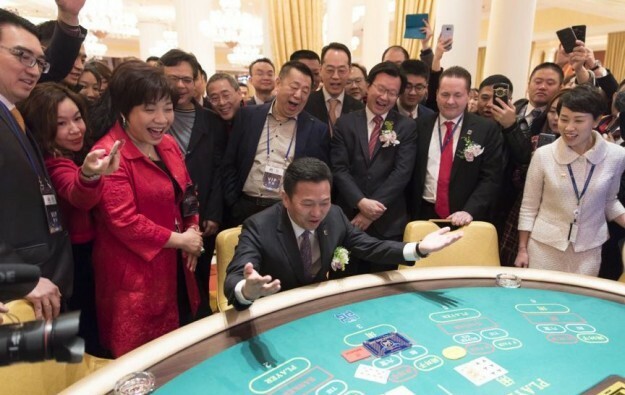 Yang Zhihui (pictured seated, centre), chairman and executive director of Landing International, was among those officiating at the opening ceremony of the casino. “The opening of Jeju Shinhwa World Landing Casino marks the full opening of the phase one of Jeju Shinhwa World,” said Mr Yang in a statement included in a press release. “In 2018, we will focus our efforts on operating Jeju Shinhwa World to deliver on our promise to make Jeju Shinhwa World into a tourism destination under the spotlight on Jeju Island that the residents will be proud of,” he added.